Please select the type of order you would like to make then click the "Next" button. I would like to order a new company. I would like to order services for an existing company. Please carefully fill out all information and make sure names are spelled correctly. Your company name will appear exactly as it is entered on this form. After filling out all information please click the "Next" button to select which services you would like to purchase. An internal document signed by the authorized person who also signed the Certificate of Formation, stating the initial members or managers of an LLC. It is often helpful to show the "hand off" or "bridge" from the name on file with the state to the owners or managers who actually own and operate the LLC. An application for an EIN, or Taxpayer ID number which is the corporate equivalent of a Social Security Number (SSN) for an individual. It is required to open a business bank account. An appilcation for a Non-US Citizen for a Taxpayer ID number which is the corporate equivalent of a Social Security Number (SSN) for an individual. It is required to open a US based bank account. Documents longer than one page have extra fees to retrieve copies of. Usually this fee is $2.00 for each additional page of a request. Documents longer than one page have extra fees to file. This does not apply to an LLC, but it is $9.00 per extra page for a corporation. When changing members on an LLC, the new members and old members need to agree to the transfer and the new agreement. This documents a change of ownership. Included is the "First Amended and Restated LLC Agreement" and the resolution of transfer signed by incoming and outgoing members showing the new capital structure and amount paid for the transferring interests. We will prepare a certificate of amendment to be filed with the Secretary of State. It adds, deletes and/or revises Articles in the previous Certificate. It can be filed to change the name of the company, the stock authorized by a corporation or any other provision in the Certificate of Incorporation or Certificate of Formation for an LLC. Sometimes this is used to put the member or manager's name on record. Book of twenty stock certificates with your company name preprinted on them. This makes it easier to issue more stock in the future. The formal procedure to end the existence of a Corporation or LLC. The distinction is the LLC Cancellation is filed after the wind-down, whereas the corporate dissolution is filed to start a 3 year wind-down process. Official document from Secretary of State to certify that an entity is in existence and has satisfied state corporate or LLC law requirements such as filing all the necessary reports and documents, having a Registered Agent and being up-to-date with regards to all penalties and fees owed to the state. This is sometimes required for banking, business transactions or other governmental authorities outside the state of incorporation. This document will be sent to you electronically through email and will not be sent through FedEx if the option is selected. The apostille is a certification from the Secretary of State required by certain countries (who have accepted the terms of the Hague Convention's international treaty). It is the equivalent of a "legalization" and avoids having to get an official filing "legalized" by the US Department of State then the foreign consulate. We can provide a company with an apostille along with their Certificate of Good Standing. This can be produced usually the same day it is ordered. A copy of a Certificate of Incorporation/Formation or Amendments thereto that has been Certified by the Secretary of State with a cover sheet and authentication code. The apostille is a certification from the Secretary of State required by certain countries (who have accepted the terms of the Hague Convention's international treaty). It is the equivalent of a "legalization" and avoids having to get an official filing "legalized" by the US Department of State then the foreign consulate. We can provide a company with an apostille along with their Certified Copy of the Certificate of Incorporation/Formation and Amendments thereto. This can be produced usually the same day it is ordered. If you are not satisfied with your current registered agent, this form can be filed to change your registered agent. This form will name "Agents and Corporations, Inc." as your registered agent going forward. The state fee is $50 and we only charge $49 to create this document, send it to you for signature, file it, return it to you and act as registered agent for the remainder of the calendar year. A 3 ring, slip-cover vinyl binder that holds materials with regards to the corporate governance history of a Corporation or LLC. Such documents can include, but are not limited to: company minutes, bylaws, corporate seal, stock certificates, and stock record. The seal is an embossed press that stamps the name of your company into paper. A Certificate of Conversion. This is like a short form merger which allows a company to change types or domicile states. For example, when a corporation changes to an LLC, or an LLC changes to a corporation. Or it could be used when a Florida LLC wants to move its state of incorporation to Delaware and therefore have Delaware law govern it's internal affairs going forward. A hand-held “raised seal” that is used to imprint or emboss the corporate name, the year of formation and the state of formation. We file with the Clerk of the Court in New Castle County, Delaware a form to indicate your business is using a trade name other than its official corporate name for doing business. It can be used by an individual sole proprietor, a Corporation, LLC or Partnership. Usually this is used for banking purposes to establish an account or process payments in a name other than your official corporate name. 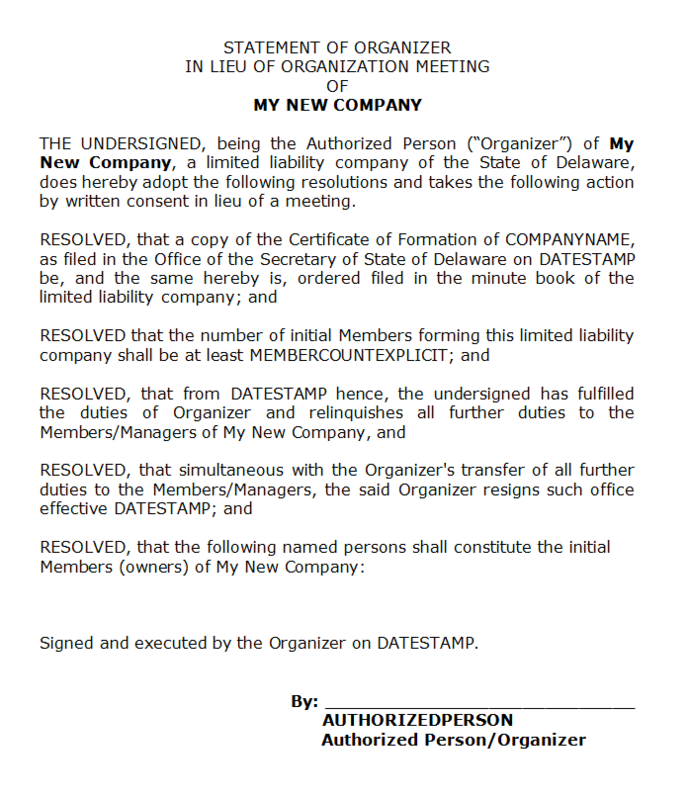 The process by which a non-US based company changes its domicile to Delaware so as to be governed under Delaware law. The Certificate of Domestication maintains the continuity of the business and merges the existing business into a newly established Delaware LLC or Corporation. Incnow can send your company's documents via email. This will provide a PDF of signed documents and a Word version for non-signed documents. This lets you edit your LLC's operating agreement more easily and speeds up document delivery. Incnow can pay a state fee for faster processing of your Nevada entity's Articles of Organization so they will file it usually within one business day, instead of a few weeks. Incnow can pay Delaware a special extra fee for faster service. We will mark your filing for 24-hour filing and Delaware will usually return the filed document to our office the next business day. Should you request faster turn around times, you should call our office to determine quoted for same-day, 2-hour, 1-hour and even 1/2 hour service. Incnow can pay a state fee for faster processing of your Nevada entity's initial list and business license so Nevada will file it usually within one business day, instead of a few weeks. The LLC Operating Agreement is an "internal document" that is necessary to establish to rights, powers and duties of the members (owners) and managers of an LLC. It is a “partnership agreement” signed by the Members of an LLC that establishes the rules and regulations of an LLCs operations. A Nevada Business Licence and Initial List of managing members are required by Nevada LLC and must be filed within 30 days of incorporating to keep the company in good standing (and annually thereafter). Therefore we suggest you file the initial list and obtain the business license at the time of formation. If you have employees or a physical office in a state other than your state of incorporation, then you should consider and may be required to "go on record" with by filing a certificate of authority to do business in that state. This is a corporate filing of out-of-state Corporations or LLCs that enable the company to do business in that particular state (i.e. a Delaware Corporation headquartered in California files a Certificate of Authority to qualify as a foreign company in California). Have you failed to pay your annual report fees resulting in the state of incorporation "administratively dissolving" your business by "declaring it void"? A Certificate of Renewal and Revival reinstates the charter and regains current Good Standing status for your company. If your company is not in good standing, this field will need to be reviewed. This is a field where you can indicate the amount of Secretary of State taxes and penalties are owed. Please call our office if you need to know the amount owed to restore Good Standing status. Many services provided cannot be complete until back fees, interest and penalties have been paid. A "premarital agreement" of the stockholders/owners who agree in advance under what conditions they will be forced to sell their stock (for example if he leaves the corporation) and it puts restrictions on the free transfer of stock to keep out unwanted third parties (for example, spouses and competitors). Every corporation with more than one stockholder should have one. Upgrade a Basic LLC or Corporation formation to a Complete package. This for an LLC is the operating agreement, essential to every LLC to detour the ownership structure. The Corporate Complete Upgrade includes the stock certificates, bylaws, resolution to appoint officers and issue stock. We will also provide a link to legal forms and tax forms with the upgrade. We send you the Certificate of Good Standing electronically, therefore FedEx does not apply. FedEx applies to all other Additional Services however. The address info filled out above will be used for all documents ordered today upon completing this initial form. If you'd like to have all future correspondence from IncNow sent to a different address, including but not limited to state and legal notices, please check this box. Otherwise, all future correspondence will be with the original address. Please select which services you would like to purchase and click the "Next" button to review your order before it is submitted. If you have any special requests please include them in the box at the bottom of the form. Signature ready agreements in paper and Electronic Mail Version. You order will not be submitted until you click the "Submit" button at the bottom of the page. Please carefully review all information before submitting your order. Your order will be processed once the check has been received and the funds have cleared. Your order will be processed once the wire transfer has been received. PLEASE EMAIL AGENTS@INCNOW.COM PRIOR TO SENDING THE WIRE AND PROVIDE US WITH A CONTACT NAME, NAME OF THE COMPANY, DATE THE WIRE IS BEING SENT AND THE SERVICE REQUESTED. Name on Account: Agents and Corporations, Inc.
INTERNAL ONLY payment option for when customers would not like to pay immediately. This option does not send the customer a transaction receipt email, nor does it create a transaction in SalesForce. Upon clicking "Submit", the page will stay here. Do not be alarmed, the order went through perfectly. We appreciate your business. You will receive an email confirming your order in the next few minutes. Please email us at agents@incnow.com or call at 800-759-2248 if you have any questions. An incorporation specialist will contact you if we have any questions about your order. Would you like to place another order with the same contact information? Agents and Corporations, Inc. does not provide legal or tax advice. The information contained herein is general information and should not be relied upon for any purpose. All contents copyright 1999-2019, Agents and Corporations, Inc. Please contact our office at your convenience. Please do not close your browser or navigate away from this page.